Sequel to popular ghost capture game to debut in two versions. 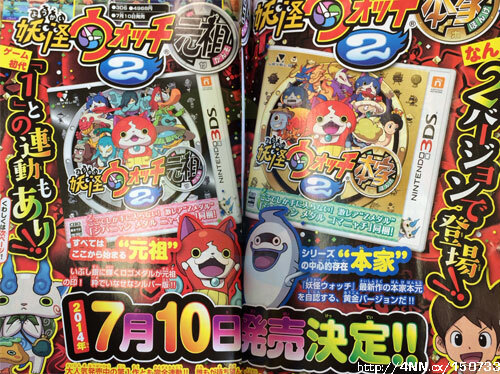 Level-5 announced Yokai Watch 2 in this month’s issue of CoroCoro magazine. The game, due out on July 10 in Japan, will ship in two versions: Yokai Watch 2: Ganso (Founder) and Yokai Watch 2: Honke (Head). Keita returns, and with the power of a mysterious ghost, travels back in time with his friends to the Sakura New Town of the Showa era. The key to the story is Keizo, a boy from the past who looks like Keita, and Dekanyan, a cat ghost with a secret. Yokai Watch 2 promises to reveal the mysterious origin of the Yokai Watch Keita receives in the first game, which allows him to see ghosts. There will be new events, such as climbing the school flagpole to search for ghosts, as well as bicycle races. If you’ve already played the first game, you’ll be able to befriend special ghosts in the sequel. As far as differences between versions go, the ultra rare silver “Jibanyan Medal Nyaiiin” Z Medal can only be obtained in the limited edition of Yokai Watch 2: Ganso. And the limited edition version of Yokai Watch 2: Honke is the only way to obtain the “Jibanyan Medal Komanyachi” Z Medal.